On the way in to work today I bunny-hopped my road bike off a curb and over a snowdrift to avoid some pedestrians on the bike path. Maybe I shouldn’t have done that. 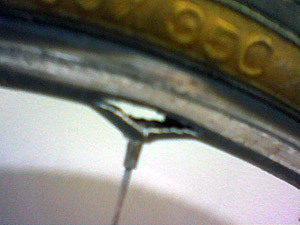 I was planning on building a new rear wheel for that bike this summer. Looks like I’ll have to do it a little sooner.